Have the flexibility to complete your program with an additional year of access as you juggle your day job, make sure dinner's on the table for your family, and tick off all the other boxes on the checklist of "real life"
Create time to invest in yourself - to build the skills you need to turn your art dreams into the flourishing art business you know it can be. Be able to look back at this exact moment, completely awestruck at what a difference such an investment made for your artful career. Got that nervous, excited feeling that's making your heart thud inside your chest? Your path in Artful Career Academy will be as unique as you are. The curriculum is broken down into delicious, bite-sized modules so that each step is easy and intuitive. Starting with a 1:1 session with Kristina Solheim, your path will center on your Artist Development Plan - made up of courses, experiences, and skills you already possess! The plan makes it easy to see where you'll need to focus. Being a part of Artful Career Academy means you'll get the support and accountability you need to push yourself out of your overwhelm. This isn't just another art course that you'll never complete. This is a roadmap to your unique and beautiful future-artist self! You’ve made a few sales here and there, but you’re ready for financial security. Maybe you’ve taught a few workshops, and now you want to reach a larger audience. You're afraid to admit you don't know what online marketing really entails and you're frustrated with the ever-mysterious "algorithm." You're tired of all the financial stress and you know there must be a shortcut to consistent income. Yes, that's a lot of money - especially if you aren't making consistent income yet from your art. But remember: this is a career development program with an experienced business coach who'll guide you every step of the way. Whether you wake up an hour early to the calm of a quiet house and a peacefully sleeping family or you choose to hire a sitter to keep an eye on the kids while you take yourself to your favorite coffeehouse once or twice a week to study and cozy up with a creamy latte - we encourage you to go at your own pace with the Academy. We deliver your special, immersive content over the course of a year. You'll also have access to the course material for a year after that to put the finishing touches on everything you've learned. A year is a long time, but you'll never have to worry about falling off the wagon because we offer heaps of accountability and live coaching throughout the program. First of all, is this even possible? Really? One program that can do all of this? Well, the answer is a resounding yes! It all started when Kristina Solheim completed a professional development program for women leaders in Silicon Valley. The experience opened her eyes to the all-too-necessary mindset shift for her to take responsibility of her career and decide to choose something besides climbing the corporate ladder. Artful Career Academy came to her one afternoon while she was waiting for her son to get his hair cut. She knew this was her soul's work. Now, Kristina gets to live her dreams everyday as she works with artists who are ready to do the work to make their own dreams real. Get on the VIP list for updates on Artful Career Academy and all the fun of getting ready for the first day of school: ACA starts September 30! All Artful Career Academy students start with the Artist Vision Workshop which is currently available for anyone for two weeks. Click on the Artist Vision image below to get started on this four-video training, complete with helpful worksheets that get your creativity going and are yours to keep! You will get clarity on your big dreamy goals and create your Artist Development Plan. You'll complete this phase with a 1:1 advising session* with your business coach to complete your development plan. You will work on establishing good habits, learning more about creative flow and setting up your studio space. You will also be encouraged to choose a mentor and submit work to a show. You'll complete this phase creating your About Me page on a simple website and writing your Artist Bio. Working artists are business owners. In this phase, you'll learn about what's currently working for small businesses and go through the steps to set up a business that will support you. First we work out financial and legal details, then we'll work together to create your income plan and create a simple marketing strategy that serves your business. This is where you pull together everything you've done so far. We'll explore finding your tribe, how to manage "all the things" as a solopreneur, and revisiting your development plan. You'll complete this phase with another 1:1 session with your business coach to look at your development plan and set goals for your career. BONUS: how to create a digital course or in-person workshop. Fingers tingling? Butterflies fluttering? Read on. Let's talk about the value you're about to dive into! Grab your best pen and your brand-new notebook because you'll be heading back to school. 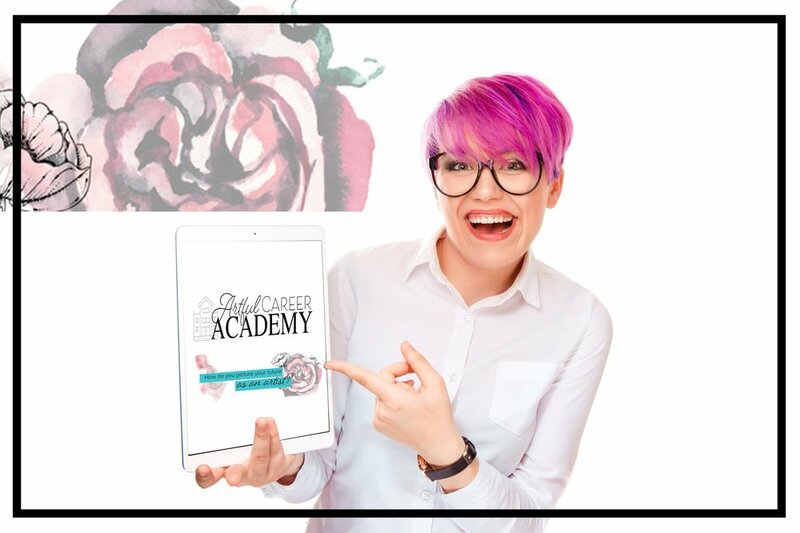 Learn what it takes to start living your life and running the creative business you’ve been daydreaming about in our one-year academy for $997 (with a payment plan available). Take that, Resistance! Inner Critic? Put your seatbelt on because Creativity is taking the wheel! this is the program you need! 5 years studying and building my own business - including working with three business coaches. I know firsthand how amazing and yet isolating it can be to develop your art while simultaneously learning how to run a business (and let's not forget being responsible for raising wonderful children, holding down a steady job to ensure there's food in the fridge, and juggling everything else). I’m so thrilled to bring you this program, because I was exactly where you are now - pushing my art and passion backstage because Real Life always (always!) had such a clever ways of showing up to steal the spotlight. I struggled for years with crippling self-doubt and just dabbling in anything and everything related to art. When friends praised my art, I just thought, If they only knew. It took years to be able to call myself an Artist. Even then, I despaired of ever doing something with my art. And when it came down to it, I didn’t like spending every day in the studio working on art. I didn’t feel that it was my soul’s work, not my passion! The Artful Career Academy is my soul’s work and I am uniquely able to help other struggling artists to discover and claim their own path. I’m also a single mom and I know that family comes first, so I understand how difficult it is to work on your art full-time or go back to traditional school. With all of this, I can help you reach your goals through the Artful Career Academy. During the Academy, you’ll have complete access to the experience I've gained over the last 20 years - which will save you from all of the costly errors and missteps that inevitably landed me where I am today [as a business owner who has the freedom to create every single day and sustain myself and my family from by doing what comes most creatively to me]. It’s a major privilege to be able to provide my students with a specialized career roadmap for artists with this signature career development program.